After the last year or so of seeing kale lauded as the second coming, I’ve had it with that crunchy, earthy green and am switching my allegiance to other good-for-you leafy things. A few nights ago I had a dinner request for fried chicken and whenever I made fried chicken, I always add collard greens to the table. 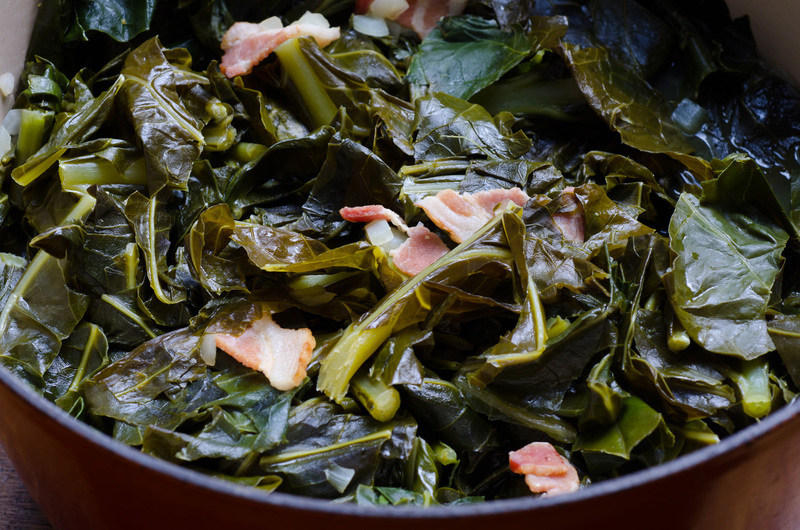 I sauté some onion and bacon (bacon ‘cause its always on hand, but if I am out and about I will pick up some ham hocks or pork belly to use) and then add the chopped collards. Once seasoned with some salt and pepper and red chile flakes, I cover the pot and just let them cook away until they are juicy, soft and tummy-warming. This can take a couple of hours or so. Then, I add a good dose of vinegar and serve them with cornbread to sop up the “pot likker” and chopped onions to add some heat and texture. Sooooo, sooooo good! And, better than kale, for sure.